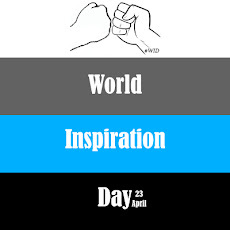 23 April: World Inspiration Day: The WORLD INSPIRATION DAY Origin! Lots of them all over the globe are curious to know the origin and source of this WORLD INSPIRATION DAY. This significant day was born to the dream of a team which gave birth to the company, Inspiration Unlimited (IU) in Bangalore, India. This visionary company was born with a mission to spread inspiration in the world through all the means and channels possible. As the influence of the company grew far and wide across the globe touching the lives of millions and bringing about a massive positive change in their lives, it gave birth to the need to set aside a day exclusively to celebrate Inspiration. To fulfill this need of the world, Inspiration Unlimited gifted the world on their anniversary the iconic day named WORLD INSPIRATION DAY. Just like how Global Entrepreneurship Congress came into existence backed up by Ewing Marion Kauffman Foundation and gave birth to Global Entrepreneurship Week which has sent ripples across the globe in the field of entrepreneurship, we believe that World Inspiration Day shall be the reason for the widespread fire of massive inspiration in the world, as we are already humbled by the support of international organizations such as WorldMERIT, Smaller Earth, Camp leaders and many more even before the moment of celebration.